The mystery of our salvation, dearly-beloved, which the Creator of the universe valued at the price of His blood, has now been carried out under conditions of humiliation from the day of His bodily birth to the end of His Passion. And although even in the form of a slave many signs of Divinity have beamed out, yet the events of all that period served particularly to show the reality of His assumed Manhood. But after the Passion, when the chains of death were broken, which had exposed its own strength by attacking Him, Who was ignorant of sin, weakness was turned into power, mortality into eternity, contumely into glory, which the Lord Jesus Christ showed by many clear proofs in the sight of many, until He carried even into heaven the triumphant victory which He had won over the dead. As therefore at the Paschal commemoration, the Lord's Resurrection was the cause of our rejoicing; so the subject of our present gladness is His Ascension, as we commemorate and duly venerate that day on which the Nature of our humility in Christ was raised above all the host of heaven, over all the ranks of angels, beyond the height of all powers, to sit with God the Father. On which Providential order of events we are founded and built up, that God's Grace might become more wondrous, when, notwithstanding the removal from men's sight of what was rightly felt to command their awe, faith did not fail, hope did not waver, love did not grow cold. For it is the strength of great minds and the light of firmly-faithful souls, unhesitatingly to believe what is not seen with the bodily sight, and there to fix one's affections whither you cannot direct your gaze. And whence should this Godliness spring up in our hearts, or how should a man be justified by faith, if our salvation rested on those things only which lie beneath our eyes? Hence our Lord said to him who seemed to doubt of Christ's Resurrection, until he had tested by sight and touch the traces of His Passion in His very Flesh: "Because you have seen Me, you have believed; blessed are they who have not seen and yet have believed" [John 20:29] . In order, therefore, dearly-beloved, that we may be capable of this blessedness, when all things were fulfilled which concerned the Gospel preaching and the mysteries of the New Testament, our Lord Jesus Christ, on the fortieth day after the Resurrection in the presence of the disciples, was raised into heaven, and terminated His presence with us in the body, to abide on the Father's right hand until the times Divinely fore-ordained for multiplying the sons of the Church are accomplished, and He comes to judge the living and the dead in the same flesh in which He ascended. And so that which till then was visible of our Redeemer was changed into a sacramental presence, and that faith might be more excellent and stronger, sight gave way to doctrine, the authority of which was to be accepted by believing hearts enlightened with rays from above. This Faith, increased by the Lord's Ascension and established by the gift of the Holy Ghost, was not terrified by bonds, imprisonments, banishments, hunger, fire, attacks by wild beasts, refined torments of cruel persecutors. For this Faith throughout the world not only men, but even women, not only beardless boys, but even tender maids, fought to the shedding of their blood. This Faith cast out spirits, drove off sicknesses, raised the dead: and through it the blessed Apostles themselves also, who after being confirmed by so many miracles and instructed by so many discourses, had yet been panic-stricken by the horrors of the Lord's Passion and had not accepted the truth of His Resurrection without hesitation, made such progress after the Lord's Ascension that everything which had previously filled them with fear was turned into joy. For they had lifted the whole contemplation of their mind to the Godhead of Him that sat at the Father's right hand, and were no longer hindered by the barrier of corporeal sight from directing their minds' gaze to that which had never departed the Father's side in descending to earth, and had not forsaken the disciples in ascending to heaven. The Son of Man and Son of God, therefore, dearly-beloved, then attained a more excellent and holier fame, when He betook Himself back to the glory of the Father's Majesty, and in an ineffable manner began to be nearer to the Father in respect of His Godhead, after having become farther away in respect of His manhood. A better instructed faith then began to draw closer to a conception of the Son's equality with the Father without the necessity of handling the corporeal substance in Christ, whereby He is less than the Father, since, while the Nature of the glorified Body still remained the faith of believers was called upon to touch not with the hand of flesh, but with the spiritual understanding the Only-begotten, Who was equal with the Father. Hence comes that which the Lord said after His Resurrection, when Mary Magdalene, representing the Church, hastened to approach and touch Him: "Touch Me not, for I have not yet ascended to My Father" [John 20:17]; that is, "I would not have you come to Me as to a human body, nor yet recognize Me by fleshly perceptions: I put you off for higher things, I prepare greater things for you: when I have ascended to My Father, then you shall handle Me more perfectly and truly, for you shall grasp what you can not touch and believe what you can not see." But when the disciples' eyes followed the ascending Lord to heaven with upward gaze of earnest wonder, two angels stood by them in raiment shining with wondrous brightness, who also said: "You men of Galilee, why stand ye gazing into heaven? This Jesus Who was taken up from you into heaven shall so come as you saw Him going into heaven" [Acts 1:11] . 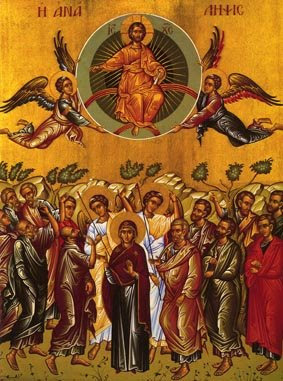 By which words all the sons of the Church were taught to believe that Jesus Christ will come visibly in the same Flesh wherewith He ascended, and not to doubt that all things are subjected to Him on Whom the ministry of angels had waited from the first beginning of His Birth. For, as an angel announced to the blessed Virgin that Christ should be conceived by the Holy Ghost, so the voice of heavenly beings sang of His being born of the Virgin also to the shepherds. As messengers from above were the first to attest His having risen from the dead, so the service of angels was employed to foretell His coming in very Flesh to judge the world, that we might understand what great powers will come with Him as Judge, when such great ones ministered to Him even in being judged. And so, dearly-beloved, let us rejoice with spiritual joy, and let us with gladness pay God worthy thanks and raise our hearts' eyes unimpeded to those heights where Christ is. Minds that have heard the call to be uplifted must not be pressed down by earthly affections, they that are fore-ordained to things eternal must not be taken up with the things that perish; they that have entered on the way of Truth must not be entangled in treacherous snares, and the faithful must so take their course through these temporal things as to remember that they are sojourning in the vale of this world, in which, even though they meet with some attractions, they must not sinfully embrace them, but bravely pass through them. For to this devotion the blessed Apostle Peter arouses us, and entreating us with that loving eagerness which he conceived for feeding Christ's sheep by the threefold profession of love for the Lord, says: "Dearly-beloved, I beseech you, as strangers and pilgrims, abstain from fleshly lusts which war against the soul" [1 Peter 2:11] . But for whom do fleshly pleasures wage war, if not for the devil, whose delight it is to fetter souls that strive after things above, with the enticements of corruptible good things, and to draw them away from those abodes from which he himself has been banished? Against his plots every believer must keep careful watch that he may crush his foe on the side whence the attack is made. And there is no more powerful weapon, dearly-beloved, against the devil's wiles than kindly mercy and bounteous charity, by which every sin is either escaped or vanquished. But this lofty power is not attained until that which is opposed to it be overthrown. And what so hostile to mercy and works of charity as avarice from the root of which spring all evils ? And unless it be destroyed by lack of nourishment, there must needs grow in the ground of that heart in which this evil weed has taken root, the thorns and briars of vices rather than any seed of true goodness. Let us then, dearly-beloved, resist this pestilential evil and follow after charity , without which no virtue can flourish, that by this path of love whereby Christ came down to us, we too may mount up to Him, to Whom with God the Father and the Holy Spirit is honour and glory for ever and ever. Amen.